This article is 2525 days old. Between now and the end of June, every homeowner in Windsor and Essex County will be receiving a new bigger Blue Box from the Essex-Windsor Solid Waste Authority. The new blue boxes are to be used for containers only, and you are requested to not overfill it with glass, as too much glass in the larger box will make it too heavy. The new blue boxes are necessary because the you can now recycle new plastics products such as food trays (single serving and platters), clamshell containers, and plastic cups. The Solid Waste Authority says that they are working with local companies to process and recycle these plastic items into lawn chairs, car bumpers, polar fleece, rugs and so on. So one day, the clamshell packaging your strawberries came in could end up as a Muskoka chair! 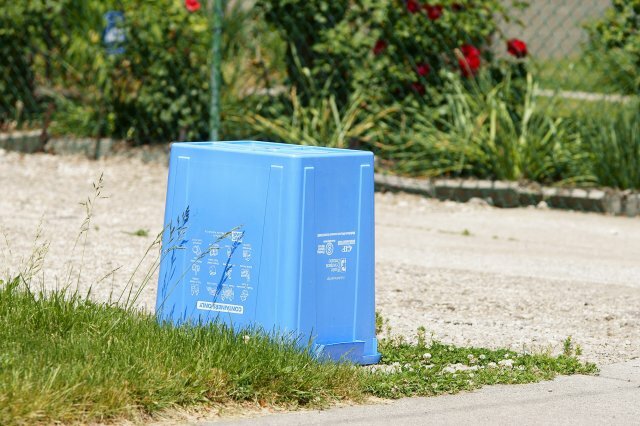 The new blue boxes will be dropped off at the end of your driveway or front yard during daylight hours sometime prior to the end of June 2012. Once the new Blue Boxes are dropped off, the Solid Waste Authority wants you to be on the look out for thieves. They say that no one should be coming to take them back, and that if you see “people or trucks” removing the new boxes, your asked to call the police or the Solid Waste Authority hotline immediately at 1-800-563-3377.